Hope you had a beautiful Easter this year with new beginnings, including a whole new way to manage your time with email. Starting today, you are going to increase your email productivity by at least 3x. Well how exactly would I do that, you might ask? Reading emails takes too damn long. We already spend tons of time reading, processing and sending emails. What if we could speed those basic email functions up by enabling us the ability to speed read? If you’ve been following the latest educational tech trends, speed reading with tools like Spritz and Spreeder are the latest innovation to how we consume information. Do you read emails fast enough to be successful? So of course there is a unique difference to how we read depending on what we are reading. For example reading a novel vs. reading an email are very different when looking at how text is visually organized and presented depending on the format. A novel has long paragraphs of on-going text, whereas an email can be both long and short. An email has headers, bullet points or numbering and text formatting. When you read an email you quickly want to get to the point, to the gist of the message context so you can process it efficiently and effectively. A painfully long email that would take forever to read. So we challenged our current means of information consumption and email productivity by asking, “How can we help people speed up the processing of emails?” Well of course we were enthusiasts about the latest news on speed reading, and yet we were also skeptics as to whether speed reading as an old concept was riding on a new wave of hype. So we wanted to find out if speed reading techniques improved since the 1970’s research on Rapid Serial Visual Repetition (RSVP). Excited about bringing a new email reading experience to users, we quickly jumped to testing the current speed readers out there like Spritz and Spreeder. Our response, “Wow! This is awesome. It actually works.” We had to provide this experience for reading emails, with some added logic in how words in an email are visualized, given formatting structures like headers and breaks in emails. Speed reading also works when using Mailbird in other languages with word spacing, so the Mailbird speed reader is not limited to English. Speed read emails at 500 WPM. I realized that I typically read emails at about 500 words per minute. 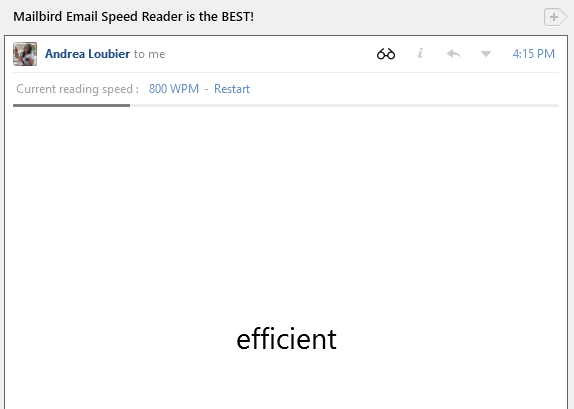 When using the Mailbird Email Speed Reader, I could easily read and quickly process my emails at 800 words per minute. We want to get to the point and clear that email out of our inbox. Of course there may be specific points in an email after speed reading where you need to reply, so the In-Line Reply feature is perfect for this. 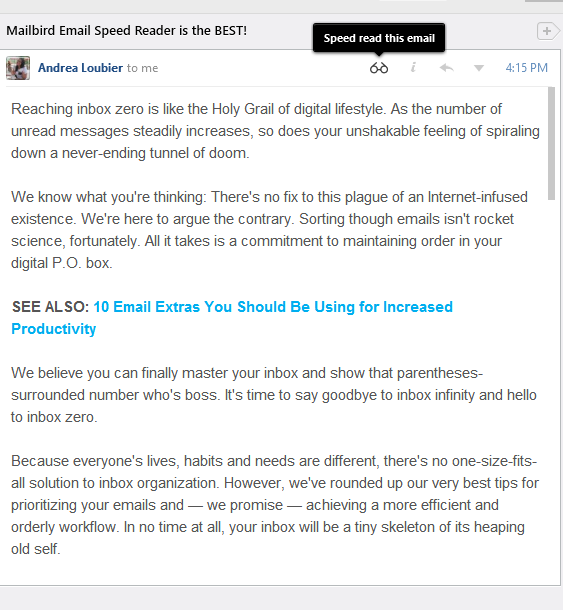 Increase your speed by at least 3x using the Mailbird Email Speed Reader. Here’s the speed reader set at 800 WPM. At least 3x faster with email. Use Mailbird today, and spend less time with each email that infiltrates your inbox. Mailbird’s Email Speed Reader is just another way we’re helping you and millions around the world, get better at reaching Inbox Zero each day. Try the Mailbird Email Speed Reader now and tell us what WPM (Words Per Minute) you speed read your emails at in the comments below and share this using the social buttons with your friends to see if they can beat your WPM in Mailbird. How to use the Mailbird Email Speed Reader? 1) Install Mailbird if you are a new user. Restart or Update Mailbird from the Options menu. 3) Click the little eye glasses icon at the top right of the message. 4) Set your WPM (words per minute). 5) To exit the speed reader hit Esc or wait for it to finish before returning to normal reading. 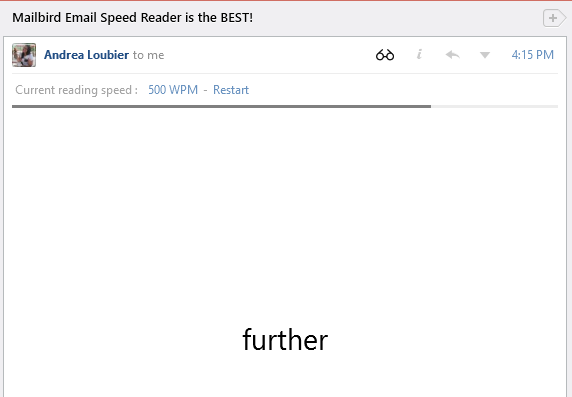 Mailbird is the best email alternative on Windows, and now the first and only email client with a special speed reader baked-in. Still not sure? You can read more about it on TechCrunch here and see it in action in this video called the Mailbird Email Speed Reader. 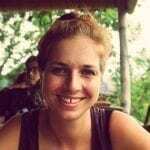 6 thoughts on "Speed Read to Inbox Zero"
I really would love to use Mailbird for my one and only email app… but I can’t until you add POP support. Any idea when that will be? I just installed Mailbird, but can’t find where to enable the binoculars to start speed reading without having to type CTRL+S or clicking the small triangle icon and then the “Speed read this message”. The binnocular is the fastest option! 🙂 Can you tell me where I can enable it?